Purchase this white ceiling register from us today to improve the airflow in your home or office. This metal air diffuser has a steel damper which allows it to direct air in two directions. Use this sidewall ceiling register in both heating and cooling needs by screw mounting it into place. Our metal air diffuser is finished in a durable white finish that will work well in any decor. The sidewall and ceiling register is lightweight and has a depth of about 3/16 of an inch. 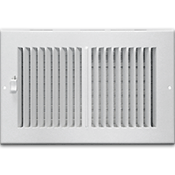 These metal air diffusers have fins spaced from each other about 1/2" apart to allow for more air to flow through the vent. ***Please note that we use 2 different manufacturers for our registers in order to have a wider variety of sizes available. Those sized marked with asterisks will be slightly different in coloring and will have a different adjustable louver than the others. If you have any questions please contact us. Tip: When ordering your metal air diffuser, you must take the measurement of your wall or ceiling opening. Do not measure your old registers faceplate. The 14 x 6 ceiling register will fit into a hole which measures 14 inches wide by 6 inches tall. The faceplate will measure slightly larger. Check out more metal air diffusers which we offer for further designs and sizes. 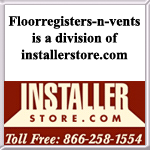 Order your ceiling register today and remove worn out and outdated metal air diffuser from your space.